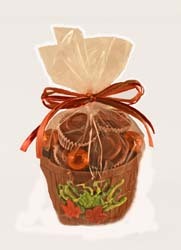 Our chocolate artisans bring you a colorful, hand-crafted autumn apple basket -- laden with Dorothy's chocolate pieces. (Choose from one of three popular types at check out.) This colorful, nostalgic reminder of Pennsylvania farms in fall is sure to be a delightful presentation for any gift-giving occasion. Beautiful-- and luscious!